Five blocks east of Plaza Bolívar is Parque Las Heroínas. 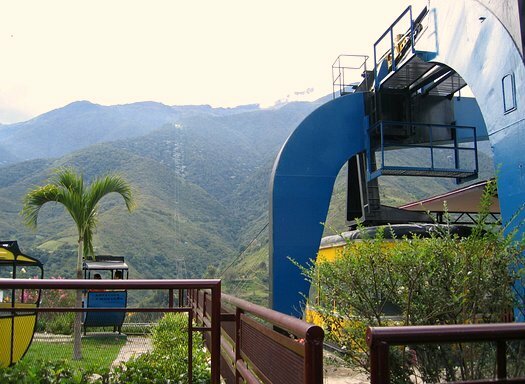 There you can catch the Teleférico de Mérida. 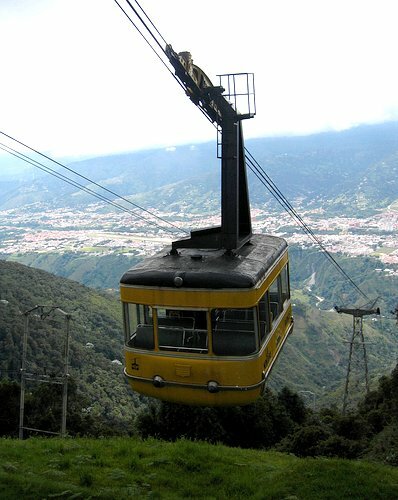 OK, I lied about the cable car system in Mérida being "little". 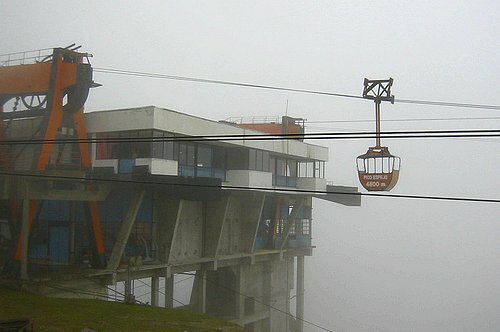 Built in 1957 by French engineers, it is the longest and highest cable car system in the world. 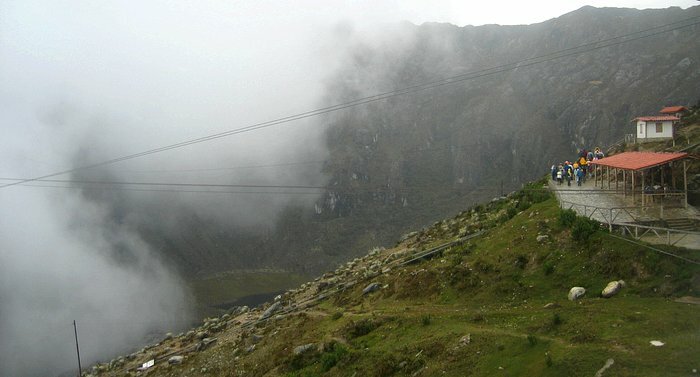 In under an hour, the teleférico ascends in four stages to the 4765 meters (15,634 feet) Pico Espejo, a mountain peak 271 meters (892 feet) taller than Switzerland's Matterhorn. Not that it would ever happen, but if you are looking for the Teleférico de Mérida, and you don't know where in town you are, there are signs to the teleférico station like the one in the picture below all over the place. The beginning. The station in Barinitas. 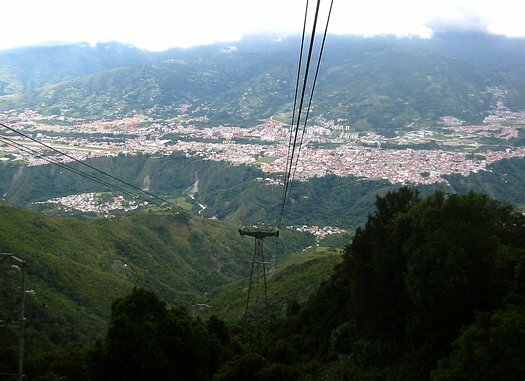 Below is Mérida and the Rio Chama valley. It was a bit cloudy and a little rainy, but still pretty and green. The 13 kilometer (8 mile) journey to the top is made in four stages. From Barinitas (Mérida) to La Montaña was a ride from an elevation of 1577 meters (5174 feet) to 2436 meters (7992 feet) over a distance of 3454 meters (2.1 miles). From La Montaña to La Aguada the rise was to 3452 meters (11,325 feet) in 3290 meters (just over 2 miles). 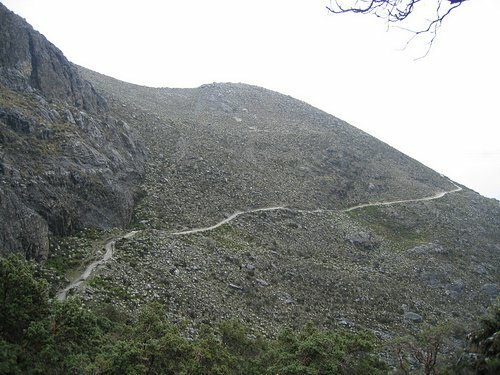 The third leg from La Aguada to Loma Redonda came up to 4045 meters (13,271 feet) in 2775 meters (1.7 miles). 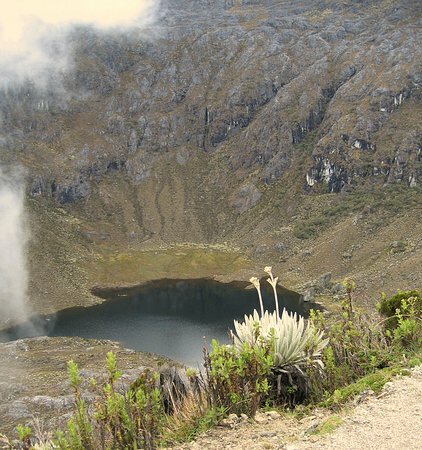 The final portion is up to Pico Espejo. 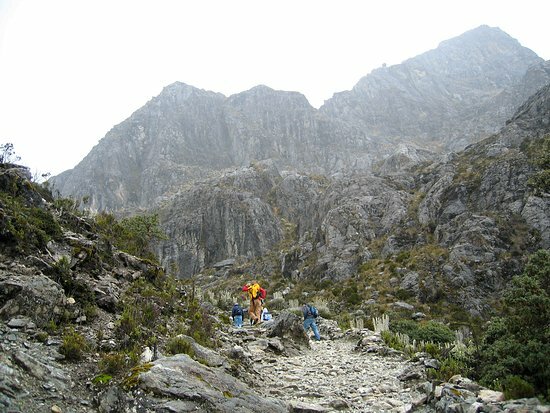 The next peak over is Pico Bolívar, Venezuela's highest peak, at 5007 meters (16,428 feet). 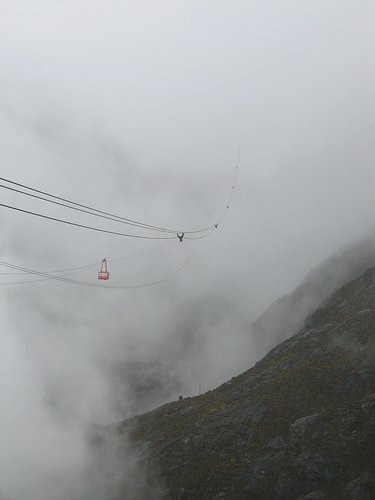 Unfortunately, the weather was just bad enough that the peaks could not be seen. Oh well. Next time. From Christmas to Easter is the peak season, and reservations must be made, but on the day we were there the cars were pretty full, but we didn't have any trouble getting tickets or a place in line. Below is the view from the Loma Redonda station. A trail continues around the corner of the mountainside where the people are gathered. 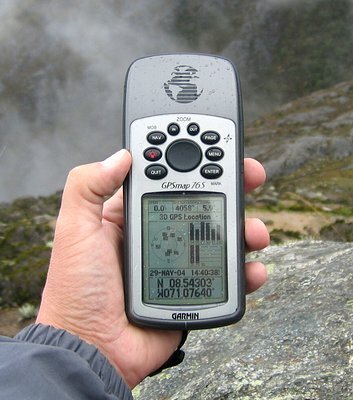 4058 meters (13,318 feet). You can barely make out the number in the middle of the top line on my GPS -- especially when you can't breathe. No, that is not the maintenance lift that is one of the cars of the last leg of the journey that went from Loma Redonda to the top. It looked like each car would have held about four people. Dang. Unfortunately the last section was closed because of the weather -- mostly the wind. It looked like it would have been pretty fun to have gone anyway. Below is the control panel for the last leg at Loma Redonda. It looks like the operator was sleeping, but he wasn't. There were several hiking trails ranging from minutes to days in length that started from this level. The people in the picture below were some college students from...Wisconsin! You just can't get away from those pesky Americans. Not even when you travel to the ends of Venezuela. 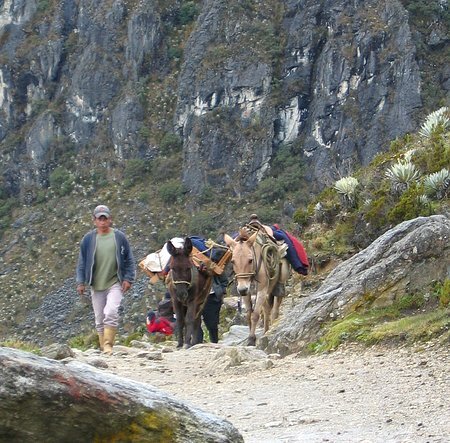 From Lomas Redonda you could hire donkeys, mules, or horses for a trip down, literally, to Los Nevados, which is a secluded mountain village that was once a garrison for Spanish conquistadors. This was an overnight trip. 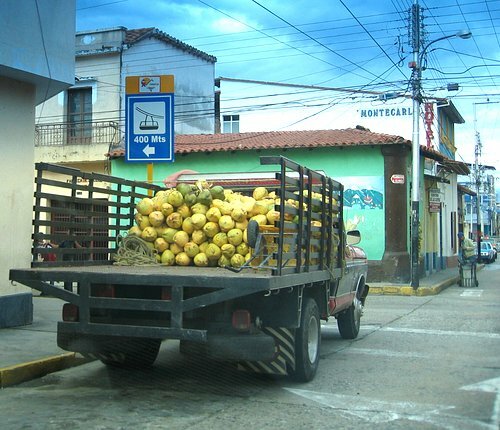 The return trip to Mérida can be made with a four-wheel-drive vehicle rather than coming back up to the top of the mountains. There were quite a few plants, small flowers, and mosses, but one plant, called frailejone, stood out. The hills were studded with them, and some of them were hundreds of years old. This plant looks a little like an aloe cactus when it's young but it only grows one centimeter a year. Below was as far as we hiked. That is the path back to the station. Behind me was the direction that the college students were headed...up. 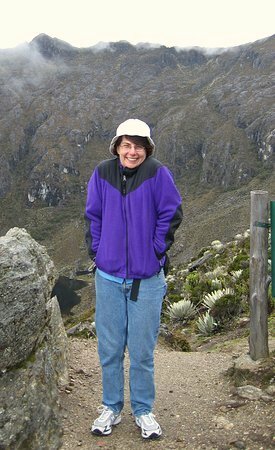 It wasn't quite T-shirt and shorts weather in Mérida, but it was definitely not T-shirt and shorts weather up here in the mountains. 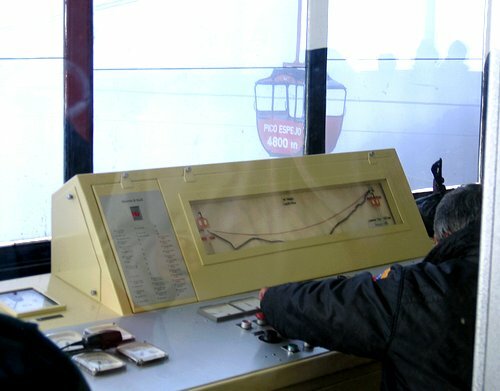 Below was one of the cars approaching the La Montaña station. All of the stations had snack shops, vendors, or restaurants in them. 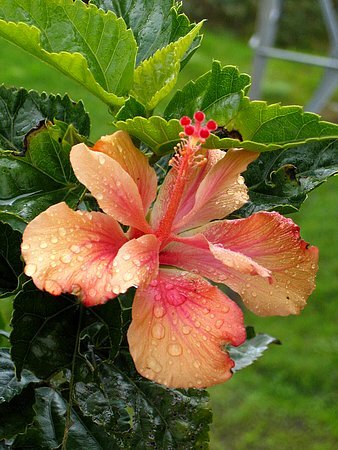 You can always count on a hibiscus bloom for a decent picture, however, you can't always count on a point and shoot to be the best camera to use to take a picture of one. This one was in a little garden at station La Montaña, the second station on the way up. I didn't even have to use a spray bottle of water to get the water drops. They were already there.